Because Southeastern College’s goal is to train career-minded individuals by offering an education that provides an employable, skilled person, the Department of Student Services offers job placement assistance to all graduates. This includes resume writing assistance, mock interviewing and student development. An online career center is available 24 hours per day, 7 days per week and job search stations with current job openings and career development resources are also offered. Personal assistance is readily available to students who wish it. It is the policy of Southeastern College’s Student Services Department to assist students in finding a position upon graduation. Prior to, and after graduation, the Student Services Department advises students in career development skills and assist them in finding employment in their chosen career field. 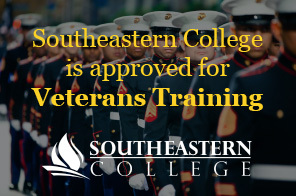 Students and graduates are also able to effectively participate in their career advancement via Southeastern College’s web-based career center at http://www.collegecentral.com/sec. interview before their graduation date. The request for salary information is only for accreditation reporting and tracking salary trends in various industries and determining statistical information on salary ranges. This information will be kept completely confidential!